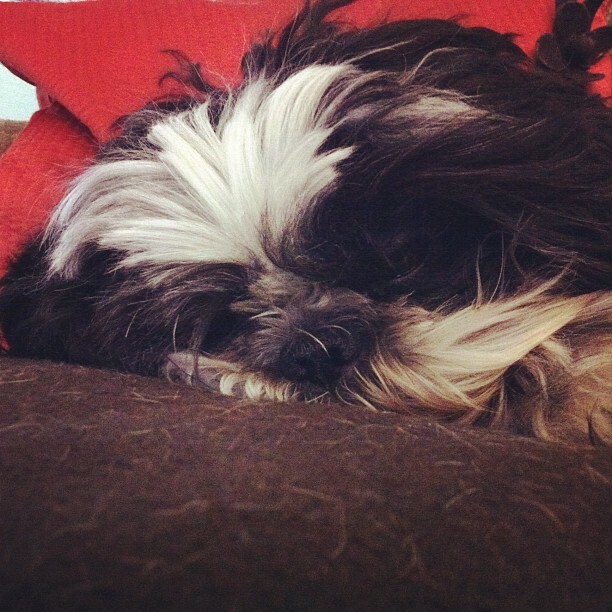 Before we begin, I have to share the cutest flipping photograph of my little pooch. I mean, his face, I just…want to kiss it all the time. I sometimes think there is no better start to the morning than a cute puppy face. Okay, let’s move onto food. The only thing better than a gooey lasagna is a gooey lasagna that takes half the time to make. Lasagna that is just as cheesy, noodley and down right delectable as the regular kind, just substantially easier and much lighter. Lasagna, my dear friends, that looks a little something, like-a-this. Sure, it’s not as pretty as stacked lagasna made with vibrant vegetables, but guys, trust me when I say this, it’s JUST as savory, creamy, decadent and delicious. 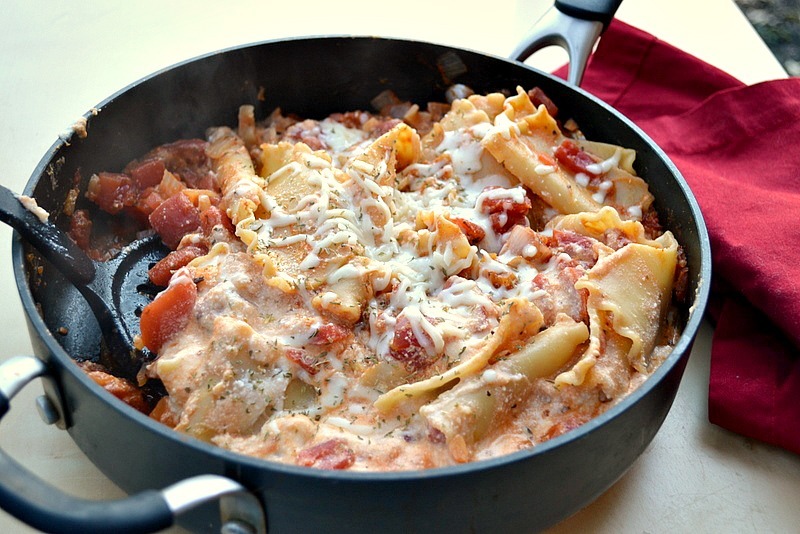 In addition to being oh-so-yummy, this skillet lasagna is lighter than most, completely vegetarian AND has only 7 Weight Watchers Points Plus points! For a gal who only gets 26 points a day, this is a god-send. Plus, wine has 4 points, so you know that’s being calculated in there too. So technically, I only have 22 points a day. So when I find meals like this that are SO mouth-watering you are thinking “and here’s another 6 pounds” with each bite for LESS THAN 8 points per hearty cup? I’m going to jump up and down and do my white-mom dance. Maybe someday I’ll let you all be privy to my dance moves. Some have called it a mix between an outdated soccer mom & Elaine from Seinfeld. Don’t be intimated by that, though. Recipe adapted from Weight Watchers One Pot cookbook. Add noodles to skillet and stir into the mixture well. Add scoops of ricotta cheese over the noodles; add in mozzarella and Parmesan. Stir in parsley. Cook about 2 more minutes, or until mixture is thick. I love living in a world where I can eat this, THIS cheesy wonder before me, have a glass of wine AND STILL LOSE WEIGHT. I’ll say, Weight Watchers, you get a fist pump for that. Wow this sounds incredible! And I love that it's low calorie, I really need to buckle down on my eating habits recently. :) Looks delish!! And what a cute puppy face, love! This sounds delicious and looks easy enough for me! Your PUP is so cute!! 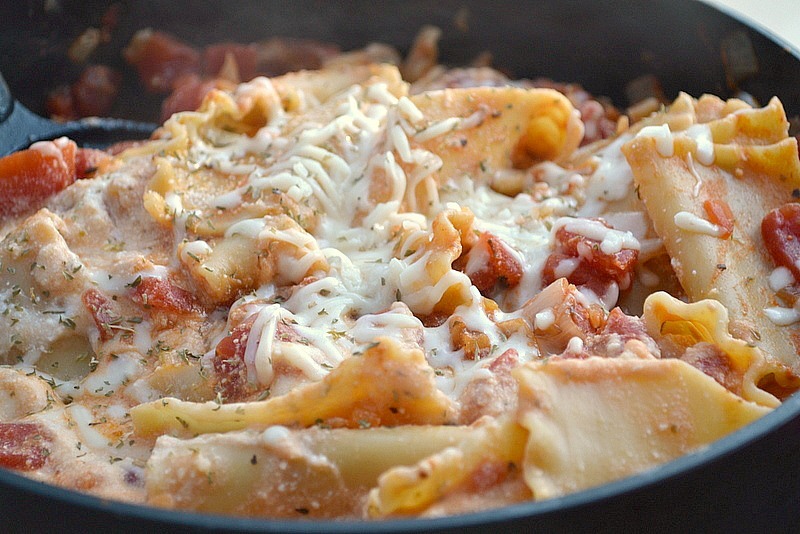 And this skillet looks like an Italian skillet of heaven. You should be my neighbor! Looks so good. And I love any post that gives a fist pump. Woo! That's awesome! 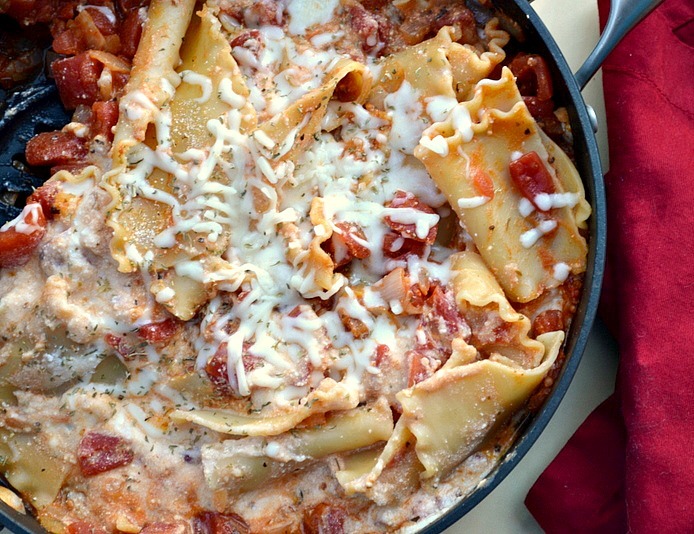 I have a recipe for slow cooker lasagna that I make sometimes, but this may be even easier! Fist pumps all around. Gosh, this looks fabulous! And "easy lasagna" is music to my ears. This may be our first Friday dinner of Lent...yum! Cute pet!!!! 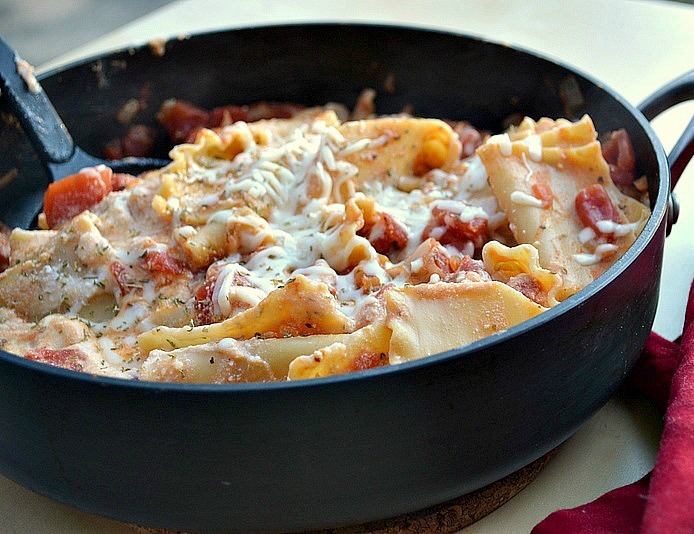 I have never heard of skillet lasagna but it sounds delish! That looks wonderful!! It really does. This would be exactly how I would make my lasagna. And in a skillet? How creative! This looks so deliciously cheese. I love that you can enjoy lasagna during the week without all the work! this sounds absolutely amazing. I love it and so would my hubby! I have to save this.. and try it! Oh MAN that looks delicious :) Beautiful, and a lovely easy to make option. This does look great.Lasagna is one of my favorite meals but it can be such a pain to make sometimes...definitely a weekend meal for me. I cannot wait to try this out. This looks awesome and way less labor-intensive! Mmmm, this looks amazing! Amazingly easy! Thanks for sharing! Cute puppy, too! Can I offer a pinch of advice? I know you love your pets, but dogs + recipes = completely unappetizing. Separate your posts, and put pet pictures in a completely separate tab or section from your food suggestions. Looks amazing - cannot wait to try it. I'm doing the low carb thing so I'll try is with cabbage leaves instead of noodles. Low-carb here too and thought I couldnt have this - TYVM for recco!! Thanks for sharing! The simplicity is great but also LOVE the fact that it makes 4 servings so I will not have to eat lasagna for a week (it sounds like a great idea until you are faced with the reality)! Thanks! The lasagne noodle are they the no-boil kind or do u cook them 1st. then add? I'm on Weight Watchers and this is a great dish to make! Thanks for sharing. HAHAHA!! so glad to "virtually" meet you. Now, please come over for wine! Made this tonight, yummy! I might use a different noodle next time. Whooo hooo! I can't wait to make this! =) Thanks for sharing! Thank you so much for this. I'll try it! It sounds wonderful, easy and figure flattering. And Lord knows, I need all the help I can get. Just made this! It was super easy and delicious! My husband loves lasagna and always wants me to make it but it is so much work. This was the perfect light and easy option! Amazing!!! We loved every bite! Has wonderful flavor and SO easy to make. We will def be making this again. Thanks for the recipe! Yummy! I am gonna make this! The only substitute I see is cottage cheese for ricotta cheese. Ricotta to me is to rich and cottage cheese makes a great substitute! Thanks for sharing! Sounds wonderful, love your pooch. Shitzu?? Yes he is! My favorite breed! made this tonight and it was very good! The only thing I did differently was add lean ground turkey after sauteing the onions and mushrooms. Then after adding the cheeses I sprinkled Italian seasoning over the top for a bit more flavor. Will definitely be making it again!!! I love skillet lasagna!!! I'll have to try this one! Your title of this post is full of body hate. Not everyone has to be "skinny". Stop giving little girls complexes about their bodies. You are part of the problem. It's certainly not meant that way, at all! It's more of just a way to categorize the dish. Trust me when I say this, I am not stick thin nor do I push people to be that way. I believe 100% in moderation, healthy living and being the best you. The title is just a title, I promise. I'm a firm believer in loving your body at any size or any age. Body hate?! Clearly you must be the one with the complex. This recipe, along with many others, merely represent healthier alternatives for those wanting to live a healthier lifestyle and it's sad not enough of these blogs are available to young teens. Don't shift the blame from the countless magazines showing off size 00 models to those that actually promote healthy eating and nutrition. Last I checked this didn't say STARVE yourself skinny. In fairness to that poster you're replying to, the emphasis isn't on health in the title, it's on thinness. Which is a reasonable point to make. This looks delicious! But I use myfitnesspal for calorie counting and when I put in the ingredients, I get a much higher calorie count (414 cals per serving) :( Just wondering if you are using a different type of noodle than the one I looked up (Barilla) or maybe fat free cheese? Thanks!!! The calorie count is per cup, not serving. I used the calorie counts that were in the book and also used My Fitness Pal as well. I typed in the ingredients to my calorie counter and got 370 per serving. Still a delicious option. FYI - Mozzarella and Parmesan most often contain animal-based Rennet, making these non vegetarian cheeses and the dish non vegetarian, unless you specifically bought vegetarian cheese using plant-based enzymes instead of Rennet. (Ricotta is vegetarian). Making this for dinner tonight! I LOVE pasta and cheese, especially together. It's always nice to find a recipe that I don't have to feel bad about making! Thank you! your white-mom comments are racist. I'm really not and the comments were not meant in that way what so ever. I'm sorry you took it that way. As an African American mom...I get it. I also do my white-mom dance when I make this dish. Delicious! If you sincerely think so, you obviously don't know what the term "racist" means. So sad that some people take a fun, innocent forum like this and add negativity and synicism. yummo!! skinny lasagne!! Thank you for sharing!! We both agreed that we like this better than the frozen kind! Definitely added to the "regulars" menu list. Thanks! Love the skillet idea...less mess and can be made quickly. For those diabetics...try replacing the noodles with thin sliced zucchini. I left out the mushrooms, but it was still delicious...this was amazing gooey and cheesy! =) Will definately be adding this to the rotation!! Love your shih Tzu! I have just like your furbaby, his name is Elvis! I also have another named Mr. BoJangles! I made this recipe this evening but substituted Barilla Lasagna "No Boil" noodles, I placed them on before I poured in the tomatoes, covered, brought to a simmer for about 15 minutes and then added the cheese, etc. I am all about skipping another pot (and more time) to boil the noodles! YUM! Thanks so much for such a tasty, quick dinner! I just stumbled on this recipe on Pinterest and I can't wait to try it. 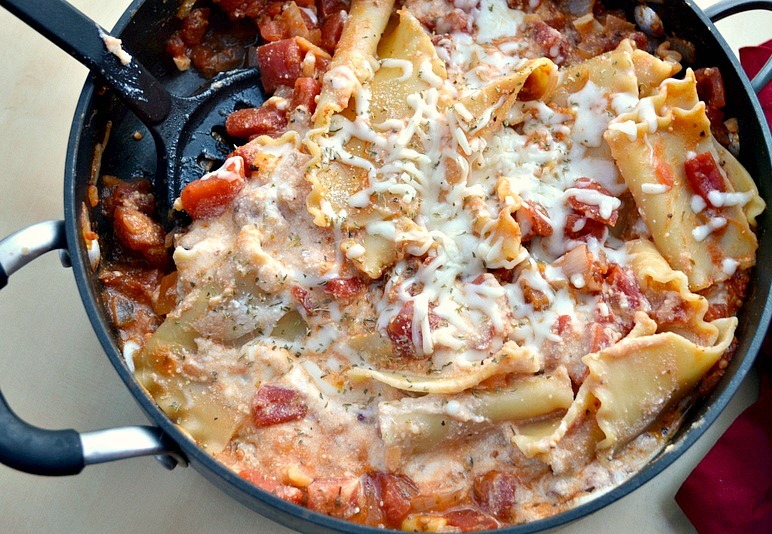 I only buy the no boil lasagna noodles (no time for two pots on quick nights!). Thank you for this tip. You saved the recipe for me! Woohooo! Dude! Your "print this" button prints the whole post and not just the recipe!! I just sent this to the designer, I'll be sure it's fixed!! I just made this for dinner with wheat pasta....it was really good! Another way to make lasagna! Sounds interesting! Have to make this also love your Pooch. Made this last night and it was delicious!! I added ground venison and spinach. It was delicious!! I will make this again for sure. I found this on pinterest, and am going to add it to my menu this week. One thing I wanted to mention is that you can add even more nutrition to it by adding some diced and steamed zucchini, and some chopped spinach. That's what my plan is, as I do this with almost every pasta recipe now. I also always add a tablespoon or so of canned pumpkin for the fiber and extra nutrients. :) This looks delicious, and I enjoyed reading your humor added to the recipe. I've made a similar thing for years. I don't use olive oil but do add pesto. I also add fresh spinach, Morningstar crumbles and, if it is summer and I have lots of garden veggies, whatever is available (zucchini, peppers, carrots). And if the family isn't ready to eat when this is ready, I just pop it in the oven with a lid on it and serve it when they are ready to go. My kids love it and don't have a clue as to the amount of veggies they are getting. Made this tonight and my husband and I love it! thanks for the recipe. I am going to try this for dinner! Your puppy is super adorable, and he looks just like my baby, Walter! If you were to make this with Dreamfield's Pasta, you would save a TON of carbs! I'm on a gestational diabetes diet, and Dreamfield's has saved me. (No, I don't work for them, just like to spread the word to other carb-conscious pasta lovers out there!) I can't wait to try this recipe, it's on my meal plan for Monday! Thanks! I love Dreamfield's Pasta!!!!!! Plus, it digests so much better and easier than other pasta's! I found this on Pinterest and had no idea it was your recipe!! Going to make it this week! Just made this and it is amaing!! I used fat free ricotta cheese and it still was awesome@! This looks great!!! What can I substitute for the ricotta cheese? I can't use cottage cheese, either. What could I substitute? Thank you so much!!! Where does all the fiber come from? It's impossible that this dish has 9 grams. If you use high fiber lasagna noodles it easily has 9g fiber. I found a similar recipe in a magazine and have made it several times. In this recipe you add the uncooked lasagne after browning vegees or meat and pour sauce on top and cook about 30 minutes. This way you dont have to cook the noodles separatly or have the extra pot to wash. This makes it truly a one pot meal! Have you tried freezing this? Made it tonight and my kids had plan!! Want to freeze and save for lunches???? Love that you factor in your wine! my kind of girl! When I put this into WW, I'm getting 10 points when I divide it by 4 servings. I'm wondering if I'm doing something wrong? Found this on Pinterest and making this for dinner tonight! Just curious as to where the nutrition information comes from. When I plug the ingredients into myfitnesspal to create a recipe, I get 377 calories, not 275. Made this for dinner tonight. It was really good. I added a pound of lean ground sirloin, but my whole family loved it! If I used whole wheat pasta will that lower the points? I have made this twice now. It is a fabulous and quick meal! I add Penzey's pizza seasoning to the sauce mixture be fore adding noodles. Sooo yummy! making this tonight... love your little puppy i have a little girl that looks like him. I cannot wait to make this this week! Thank you! I continue to look for healthy, yet still yummy meals that my family will enjoy! We made this tonight with ground turkey added and it was DELISH! will definately be making again, thank you! Wahoo!! Glad you loved it! I found this on Pinterest and we tried it for dinner tonight. We really enjoyed it. Although we are meat eaters, we enjoy throwing in some vegetarian dishes on occasion. Thanks for sharing. This is awesome!!! My kids LOVED it! I made this for dinner tonight and loved it. I am saving it and plan to add it to my regular rotation! Thanks for posting. how many cups in the skillet? Found this over on Pinterest. Made it last night and oh my goodness it was SO good! That was one of the best sauces EVER! Made this for dinner. It was the perfect weeknight meal! do you think that you could use egg plant instead of the noodles? I found a picture of this fabulous Lasagna on Pinterest and I had to have the recipe and viola here it as promised by the one who posted the picture. Thanks so much. I will make it soon. Am single and always looking for scrumptious recipes! Looks delish!! Definitely gonna try it. But for even more deliciousness, I think I will add some spinach! !